Without fail, every year during Lexington's Pride festival I am either working or out of town. If I am working in the shop I usually pick a rainbow project to work on as a minor celebration, this year I decided to make a free cross stitch pattern. I thought of this yesterday so I don't have a stitched sample to show, but the finished piece will fit into a 6" embroidery hoop or in a 6"x6" square frame if you prefer. Patterns for both versions of Lexington Pride can be found here. 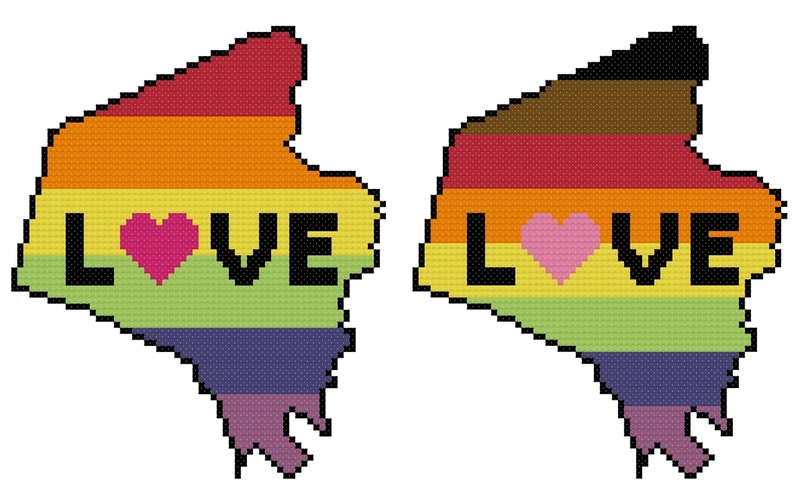 I am including two versions, one with the traditional pride flag colors and one with the new flag colors adapted by Philadelphia to encourage intersectionality in the movement. While visually I prefer my rainbows without non-rainbow colors, intersectionality is absolutely necessary in any movement so I really appreciate the city of Philadelphia recognizing this and all of the resulting conversation about their flag changes. Happy Pride, y'all! !